Keywords: Hemodialysis, Internal jugular vein, Subclavian vein, Catheter, Patient comfort. Objective: To compare hemodialysis (HD) internal jugular vein (IJV) versus subclavian vein (SCV) catheters in terms of procedural complications, patients’ comfort, tolerance and cost effectiveness. 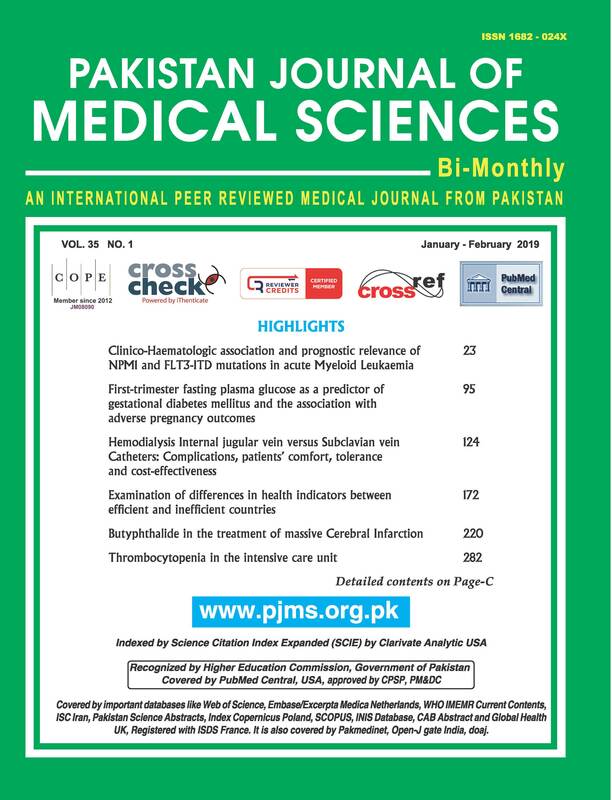 Methods: Sixty six consecutive eligible adult patients planned for hemodialysis @ 3 sessions/ week for maximum 42 days in a private hospital at Sialkot, Pakistan were documented between March 2017 and April 2018. A group, IJV or SCV catheter was allotted to alternate subjects. The catheters were inserted as per practice guidelines. Record of catheter-related complications (CRCs) was computerized. Similarly, patients’ uncomfortability and expenditures on management of CRCs were recorded. Results: Of 66 cases, 62 (93.9%, 31/group) successfully completed the study. Baseline information showed male predominance (n = 47, 75.8%), age (M = 47, range 24-75 years) or catheter stay time (M = 40 days). The rate of vein damage or artery puncture was found higher in IJV than SCV group [(13.9 vs. 6.5%) or (9.7 vs. 3.2%), respectively] during catheterization. The difference also existed in late CRCs such as bacterial infection (32.3 vs. 16.1%), or device dysfunctioning (9.7 vs. 3.2%) with an exception of mechanical kinking. All the patients of IJV or SCV group with missed (19.4 vs. 6.5%) or shortened HD sessions (22.6 vs. 12.9%) reported CRCs-based discomfort as a cause of the regularity. Moreover, the participants of IJV group consumed 69% of the total expenditures on CRCs management. Conclusion: SCV is a better site for HD catheterization as it has comparatively lesser likelihood of complications, patients’ feel comfortable and it is also cost-effective.than IJV. Shafique MN, Akhtar SH, Mahnoor M, Hussain M. Hemodialysis Internal jugular vein versus Subclavian vein Catheters: Complications, patients’ comfort, tolerance and cost-effectiveness. Pak J Med Sci. 2019;35(1):124-128.